The Center for Creative Change (C3) periodically puts on an �Open House�. The Open House is a 2-hour presentation to prospective graduate students, to both answer their questions and to excite them about the opportunity that C3 provides. While the current Open House is adequate there is a sense that it is could be better. Toward this goal, the clients have engaged the design team to facilitate the development of ideas that will reinvigorate the Open House presentation. As clients, Wendy Olsen and Farouk Seif represent C3 and Antioch. Design Team2 is comprised of John Bell, Scott Traynor and Michael Beaton. The team met twice with the Wendy Olsen and once with Farouk. The clients and the design team used collaboration and lively discussion to develop design goals, criteria and constraints. The design team used these goals, criteria and constraints to develop the following proposal. The design team worked to identify characteristics of the current Open House through conversations with the clients about the Open House, the design team�s own student experience and focus groups that had been conducted in a previous quarter. Elements of the existing Open House and of the Antioch experience were taken as examples from which specific qualities could be discerned. These specific qualities were goals, criteria and constraints that the design team explored during the design process. The design team entered the collaborative process with an experiential, ethnographic approach. During our conversations we explored the open house as it currently is presented as a basis for inquiring into the intent and purpose of the Open House. Two overall design elements, that inform our entire project, were derived. These are information and excitement. The open house should provide information. The primary way this would be done is to anticipate questions and attempt to develop design elements that best supported that purpose. Another aspect of providing information that is often overlooked is to help participants develop and articulate new questions they may not have known to ask. In many cases it will not be possible to answer all the questions for each student in the 2 hours available for the Open House. It is important to provide direction on how to get answers to those questions. An important goal of the open house is to general excitement for the participants. The potential students should be excited about Antioch and the opportunity to enroll. Further, the faculty and staff should be excited by the chance to do something worthwhile during the open house presentation. � Time – The open house happens on a single day, in the same week as other presentations. There must be some activity for the 2 hours scheduled. Activities before and after are possible. � Place – The open house happens at Antioch, in room 100. Some open house presentations use breakout rooms. � Budget – There is not unlimited funds. There are funds available for �one time� expenses. There are additional C3 specific funds available, as well as the budget provided by the University itself. � The presentation must feature C3 as a whole as well as provide information about the specific degree and certificate programs available. � The open house should give the participants an idea of what they would experience as a student. � get their questions answered, or have the resources to do so. � filter out those for whom Antioch would not be a good fit. � The overall event is a marketing event – this needs to be kept in mind – the desired outcome is excitement in the attendees so the right people are motivated to apply. We developed several elements, three of which we will particularly highlight, and several which we have included in this proposal. These design elements have been used to develop a proposed agenda for a dynamic open house that creatively fulfills the requirements articulated by the client. Further iterative dialogue would provide the finishing touches to the proposal. In order to address the constraint of time and the quantity of information that needs to be presented we suggest reorganizing the presentation into three separate rooms. The intent of this is to allow the �main stage� to present the most critical information while offloading other information to other rooms. This addresses the issues of presenting the most interesting and essential information, supporting the goal of maintaining audience interest, while still having all the information available and allowing us a more effective use of the time. o Offload less essential information from the main presentation to maximize the effectiveness of the time for the essential information. o Incorporate wall posters – or hang from ceiling in space. � Surround the screen with the program information. See Below. � Allow for 3-4 staff to comfortably be in each program location. � Staff the program table with a Faculty member, student, Alumni, and possibly someone representing the work community. o This supports the idea of having information and resources available to address the student at each stage. � Like a cubical divider panel. � Creates a defined space for the program. Creates a different space than simply a desk. � Lighting on each panel. o To make the space more inviting than the ambient fluorescent room lighting. � Wendy indicated that sometimes she gets too involved in logistical details when she should be circulating throughout the room making sure each attendee is getting their needs met. 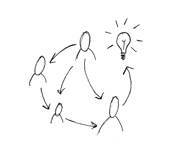 � This also supports the notion of providing attendees students with a next step while they are in the room. o Possibly a looping movie. The idea being to have a place where interesting information is being presented in a multimedia forum where participants can come and go at leisure. Content of this presentation could include faculty interviews, a deeper history of the university, perhaps in depth interviews with employers and clients of Antioch graduates. � Allowing for easy in and out movement. The overall idea behind these three rooms is to have a layout and relationship between the rooms that are compelling/inviting to for participants to want to visit. It should be easy to move in and out of these various rooms. This means that participants should feel comfortable entering or leaving these rooms at various intervals that allow for their participation in other activities. One way to facilitate this would be to have the looping media be short enough that there are opportunities to join or leave. Other activities in the experiential room should have structural breaks such that one would not feel rude entering or leaving at some frequent interval. In the existing open house, most of the content that fills out the structure is fluid. The static content is comprised of a PowerPoint presentation and a video. Therefore, these are the point when the most consistent information is provided. Any changes to the open house must preserve this function or find another method to provide consistent information. During our meetings with the client, we identified that the PowerPoint presentation currently contains a very important element. The video interview with an employer is an element to which many participants pay close attention. Any changes to the open house must preserve this element or devise another method for developing the same combination of excitement about possibilities and information about life after graduation from an Antioch program. The team identified several overlaps in content in the PowerPoint and video. There was video in the PowerPoint, even though there was already a video component to the presentation. The PowerPoint presentation also included elements that were repeated in other parts of the overall program, such as quotes from students. 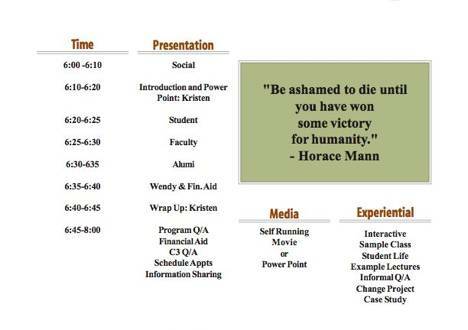 Furthermore, the quotes from students in the PowerPoint are flashed on the screen and the audience is left to read them individually, which is less exciting and engaging than other opportunities for communicating with current students. The design team approached the PowerPoint presentation with special care. As a group we are especially sensitive to the way that such presentations are often misused as a primary focus instead of being an aid to the presenter. Our group�s observations of the status quo open house included points where the participants were asked to read the slides themselves, where the presenter merely read the slide aloud and where the slides did not appear to fulfill the intention of providing information and generating excitement about Antioch. Each slide was examined for intent. This intent was then used to evaluate if the slide fulfilled the purpose it was created. The design team determined that the presentation could be both shorter and richer in content. One of the elements that we have enhanced overall in the dynamic open house proposal is the collateral information provided. Some of this will be described in the next section, but we determined that the place for information about the overall structure of C3, and the framework for the course schedule is in the PowerPoint presentation. We want to highlight the section of the presentation on which we focused the most. The design team and clients together recognized that there were a number of topics of overall C3 design that were not being communicated as well as they could be. In our meetings, we determined that very little was being said about the case study, change project and thesis. Further, the relationship between then classes was not being shown. 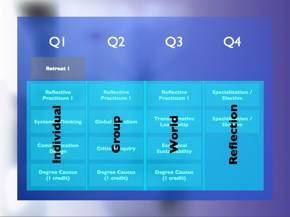 The design team took the class schedule slides as a primary place where re-design could help with the overall goals of the open house. The video interview with an employer consistently draws the attention of the participants. In our conversation, we were able to abstract from this specific instance the need to highlight what graduates of the Center�s programs do after graduating. In the previous design element we paid particular attention to increasing the chance for participants to interact with alumni, employers and RP2 host site representatives. We further support this by including alumni at each degree table. During our conversation with the client we have also identified that there are important elements to the whole student career that are not well represented. There is a framework of relationships between the classes that is not well expressed by the current materials. These interconnections are an important element of information that can be provided, but is not currently well represented. Further, a well-developed and concise presentation of the framework for the student experience is likely to increase participant excitement for the program as a whole. In focus groups, the interdisciplinary, collaborative nature of the program is often mentioned as important for current students. Further, presenting the whole, instead of just components, in the presentation will model a primary element of the Antioch experience: Wholism. The client also stated that there have been times with participants would want to see the Power Point Presentation again for more details. This process is very time consuming and requires a staff member to focus a large amount of time to one participant. We suggest one new design and a redesign of existing visual aids. The new design would be a wall mounted poster listing the quarters and classes needed for completion for the C3 Program. This poster should be large enough to see from any where in the room. 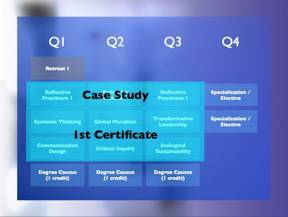 It would act as a visual aid when explaining each phase of curriculum, including the classes, case study, change project, Thesis, Certificates, Caucus, Reflective Practicum and the themes for each quarter. This would allow multiple people to view the poster at the same time and free up one staff member. The C3, WSD, GMP, ENC, and OPP would all have the same information about the first year of classes including RP1, Caucus and the Core Courses. They would also list the requirements for the Case Study and the themes for each quarter. The rest of the flyer will list program specific information including sample of classes that are required. They will have information related to alumni and where you might go after completing this program. Our client specifically talked about the lack of information they have about the history of Antioch. The history is rich and very worthy to share with the participants. This flyer should address that information the client would like to share. While each program could include an FAQ tailored to fit their flyer, we feel that there are common questions being asked across the programs. This flyer should address those FAQ as well as information about the school. This flyer should/could go hand in hand with the C3 flyer. Information tailored to fit the entire C3 program. One of the main topics not discussed in detail is the Case Study and Change Project. In our conversations with the client, we also determined that little emphasis is placed on the case study and the change project during the entire open house. These are important elements of information, and likely to be the catalyst for excitement from the participants about the program as a whole. in focus groups, the practical component is one element than many current students cite as important in their decision to attend the university. An agenda for the evening should be prominently posted. This provides context for the experience and also will help to simulate the experience of the participants as Antioch students. The design team has combined the design elements into a program for the evening. Playing with the constraints of time and place, this design team was able to develop several ideas that met the criteria of the open house in other formats. One way to generate excitement about Antioch and to develop a conduit for information about what Antioch is like for students would be to develop alternate delivery methods. For example, some Universities provide lectures via local cable or as videos that can be ordered. Presenting this first as a service to the community provides marketing as a benefit. Highlighting the notion that service to the community is marketing, the design team developed the notion that C3 could offer 1-credit classes to the community on a weekend that alternated from residencies. This would provide many of the experiential, interactive elements to familiarize participants with what it is to be an Antioch student as well as performing an intrinsically good service for the community. C3 might find that this alternate weekend becomes an important part of emergent services to itself. One option would be to provide experiential labs that were optional components for students able to enroll without requiring out of town students to be on campus outside of residency weekends. This could become a bridge between providing low-residency programs and more intensely engaging programs for those willing and able. Another related notion is to provide lectures before the open house, which are part of the overall program, but not absolutely linked. After developing this notion, the design team was informed by the clients that this had been done on at least one occasion in the past. o A page or two that has essential information, phone numbers, perhaps dates and times, along with recurring questions that arise in these sessions and in even in private meetings with advisors. o To give the prospective student an idea of what the classes are about. They do not have to be the most current. o Maybe have them at each program table. o Illustrating some of the work that students actually do. Wendy indicated that there is a new position at Antioch specifically tasked to establish relationships with Antioch Alumni. We believe alumni participation in the Open House is critical to the success of the evening. As noted above we propose to integrate alum into the teams that staff the program tables. Additionally it would be useful for Antioch to institute a survey that would garner information about what Antioch graduates do after getting their degree. Wendy indicated more than once that the section where the employer talks in the current video is where attendees really �perk up�. 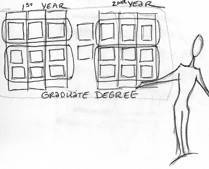 We think this �post-degree� information should be a focus of the information presented. Specific information that will be useful would be the job sectors graduates move into, perhaps a list of companies that have historically hired graduates, along with some salary survey information. Regarding the notion of having materials and the information available to fully address the participants needs it may be useful to have a post meeting debrief session. A review of things that worked, perhaps didn�t work and ways to make adjustments for future presentations. One thing we hope would come out in these meetings to get a sense of the type of people that are coming to these sessions and the type of questions are being asked. Paying attention to these elements will help keep the system at Antioch open to its potential base of students as well as providing feedback to make the Open House sessions better. Recurring questions or things that the staff find are confusing participants could be addressed in future updates to the FAQ sheet. Where appropriate the information could be added to the Antioch web site as well.